Smart growth is usually thought of as something that occurs at the regional level. But it is really the cumulative result of literally hundreds of thousands of new housing units, millions of square feet of commercial buildings and kilometres of infrastructure that will be built in the Zone over the coming years. In order to achieve smart growth at the regional level, we must first achieve it at the project level. But what does smart growth look like on the ground? How will we know when we are achieving smart growth in the only way possible, i.e. one development project and building at a time? a greater share of development in nodes and on already-urbanised lands and in key suburban nodes. Of all the factors described herein, density has by far the greatest impact on achieving smart growth objectives. "Net" density relates to an individual lot or lots; it does not include public spaces such as roads or parks in the calculation of land area.3 Increasing net density can be achieved through smaller house lots, denser development forms (e.g. townhouses, stacked townhouses or mid-rise buildings), and a more efficient use of land. A key factor in achieving higher net densities is the treatment of surface parking. For multi-unit residential and most non-residential development, particularly in suburban areas, surface parking accounts for the lion's share of the use of a site. Many building types built today in suburban areas would be considered smart development - except for the fact that they sit on very large lots devoted to surface parking, and therefore result in low net densities. Data on non-residential densities is very poor and thus it is difficult to say at this point what the trend is, particularly across the Zone as a whole. Limited evidence suggests that employment densities have been declining precipitously.6 However, more comprehensive data is required on this issue. Gross densities (which include land devoted to public infrastructure such as roads, parks, school sites, and environmentally sensitive areas in their calculation, as well as net lands) have tended to fall in the Zone, even in some cases in the face of increasing net densities. This means that the share of land devoted to public uses and infrastructure is increasing. This suggests a need to address the public component of development, through implementation of alternative development standards, for example, or joint-use facilities. Research has shown that some specific elements of public infrastructure occupy an increasing proportion of land in new development areas.7 For example, public open space accounted for between 1.6 and 5.6% in older communities, compared to10.7 to 16.7% of gross area in newer ones. The share of land devoted to schools ranged from 2.4 to 5.3% in older communities, compared to 4.3 to 8.2% of land in newly developing areas. Thus in order to achieve smart development, both net and gross densities need to be improved. On the net density side, it is important to note that increasing net density does not need to involve high rise buildings (though these may be appropriate in some strategic smart growth locations across the region, such as major nodes or centres associated with high quality transit). However, very respectable net densities can be achieved with low rise forms. Figure 1 shows, for example, that within the Zone, older neighbourhoods have achieved densities that are comparable to or higher than newer neighbourhoods, while maintaining a low rise form.9 Newer neighbourhoods have tended to rely more heavily on high rise apartments to achieve higher densities. Generally, the older areas have smaller residential lots, and a greater mix of semi-detached, row houses, low rise apartment buildings and accessory units. Similarly, it should also be noted that while low rise can mean relatively high density, high rise does not automatically equate to high densities. High rise buildings sited upon large lots (often devoted largely to surface parking, as noted above), result in relatively low net densities. While smart development does mean achieving higher net densities, this does not in turn require high rise forms. Indeed, many building types that are commonly being built across the Central Zone today might be consistent with smart growth, if only lot sizes and in particular, areas devoted to surface parking could be reduced. Mixing residential and employment uses within a building, node or subdivision also supports smart growth objectives. Including a mix of housing types on the local level can also support better retail and community services, and provide places for new households or empty nesters. Over time, mixed, adaptable areas are better equipped to withstand "boom and bust" cycles typically associated with areas that are made up mostly of single detached and town houses. There is little data or analysis that has been performed to date on trends in mixing of land uses in the Central Ontario Zone, particularly residential and employment-oriented lands. As other research undertaken by Neptis for the Central Ontario Smart Growth exercise shows, it is primarily the newer areas of the Zone that are more single-use in orientation, while the older areas contain a closer mix of employment and residential uses.11 This is because the newer urban areas tend to have much larger contiguous areas of employment, and much larger, contiguous residential areas. More research needs to be done to assess current levels of and trends related to mixing of uses. As discussed above, housing types such as small apartment buildings, or townhouses are attractive in their ability to combine high amenity with higher density. But the GTA has a high proportion of housing in high rises (five storeys and up) compared to other Canadian cities and less of its stock in mid-rise types in the three to eight storey range. Particularly in the newly urbanising areas, new housing tends to consist primarily of single detached units and townhouses, with some stacked townhouses and high rise apartment buildings. Figure 2 shows a comparison of the Toronto Census Metropolitan Area (CMA) and a combination of the Toronto, Hamilton, St. Catharines-Niagara and Kitchener CMAs ("combined") with the Vancouver and Montreal CMAs.12 The graph shows that our region relies more heavily in high rise apartments than Montreal and even Vancouver, and much less on the mid-rise forms, such as townhouses or low-rise apartment buildings. Moreover, an analysis of trends indicates that between 1996 and 2001, the share of "other" types actually dropped while the share of detached units rose in the Central Zone. With respect to the non-residential sector, most development in the Central Ontario Zone has occurred in suburban areas in recent years, particularly upon greenfields sites. Offices, industrial, distribution or retail facilities most frequently consist of single-storey buildings surrounded by surface parking and generous setbacks. Office buildings are a notable exception, that can be found in the two to eight storey range. This represents a fairly limited range of built forms and urban environments catering to employment-oriented uses. As or even more important to achieving smart growth is not just what the development is like, but also where it occurs. Many developments that are built in the Central Zone today are of a form consistent with smart growth, and could support smart growth at the regional level, except for the fact that they are not in appropriate locations. In order for smart growth to be achieved, a much greater share of future growth needs to be accommodated within the already urbanised part of the region, and in designated strategic suburban nodes. Smart development means taking advantage of existing and future redevelopment opportunities, including small scale infill, redevelopment of brownfields, and redevelopment of underutilised lands such as large surface parking lots or strip malls. Most recent data for the GTA shows for example, that as of 2001, there were about 260,000 residential units in the development approvals process in the GTA.13 Across the GTA, about 15% of these units were slated to be developed on already-urbanised lands; however, the City of Toronto accounted for 81% of these. In the four regions surrounding the City, only 3% of the units are slated for already-urbanised land. Smart development means taking advantage of reurbanisation opportunities across the entire Central Ontario Zone, not just in the City of Toronto, but in the many other mature and maturing urban centres such as Hamilton, St. Catherines, Mississagua or Whitby. The creation of mixed use concentrations of development at key locations to act as regional centres is particularly important as the urban area of the Central Zone continues to grow and becomes very large. These mixed use nodes and denser corridors that connect them are essential to reducing auto trip distances and supporting transit, and in providing civic centres for outer municipalities and places for offices and other high order services. The GTA adopted a "multi-nodal" vision for its development in the early 1990s. The vision was carried through to regional and then local official plans. A number of suburban nodes were identified for denser, mixed use development. Nodes within the already-urbanised part of the region have been relatively successful in attracting new development in recent years, such as the North York City Centre and downtown Toronto, for example. The presence of quality transit is one important factor in the success of these nodes. On the other hand, the newer suburban nodes have not attracted much growth.14 This is true even as the areas around the suburban nodes continue to develop and attract significant development. To summarise, there are a few, particularly key elements that characterise smart development - including higher densities (though not necessarily higher buildings), mixing of use, a wider range of choice in residential and commercial built forms, and location. Smart development is especially needed in areas of strategic significance to smart growth in the region - including a limited number of nodes and corridors linked to quality transit. In the Central Ontario Zone, smart development is not particularly a built form issue. That is, it is not particularly a question of building new types of buildings, though certainly the range of choice could be broadened and more innovative development forms permitted and encouraged. There are many instances of buildings and development projects across the region that could be considered smart development - if not for two issues: 1) they tend not be located in strategic smart growth locations, and 2) they tend to be surrounded by large areas of surface parking. In order to illustrate some of the characteristics of smart development highlighted above, fifteen examples of smart development are shown in Appendix A. The examples were chosen because they embody one or more of the components discussed above and were seen as viable since most were built recently, predominantly in the Central Ontario Zone. Density All the projects presented incorporate a solution to increase density, for example narrower internal streets and a rowhouse design in Upper East Side. Parking solutions. Several projects increase their density by replacing surface parking with structured or underground parking. Most non-residential projects presented are in this situation. 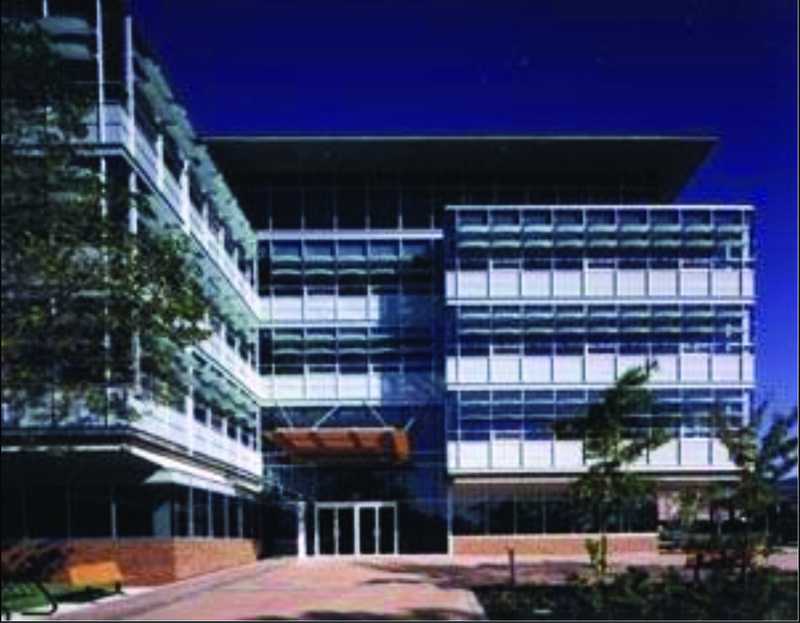 The Computer Sciences Corporation building integrates structured parking within the building itself and achieves a uniform appearance. Mix of uses Several buildings presented offer a mix of residential and employment uses: from the first floor of a townhouse to the entire ground floor of a condominium building. The proposed buildings at the Vaughan Corporate Centre are a unique combination of a "big box" store topped by two floors of office. Attractiveness The residential projects presented in Appendix A combine an efficient use of land with an attractive design. Several of these projects are marketed as "prestige" projects and command a price premium. Mid-rise Three examples from other provinces, Discovery Reach, The Carrington and Le Domaine Duvernay constitute a form - the mid-rise residential building - that combines high density with a high degree of attractiveness at mid-rise heights. They make use of wood frame and steel frame construction techniques that are not generally used in Ontario for mid-rise buildings. 2. See, for example, Newman, Peter & Jeffrey Kenworthy, 1999, Sustainability and Cities: Overcoming Automobile Dependence, Washington, D.C: Island Press; Cervero, Robert, 1998, The Transit Metropolis: A Global Inquiry, Washington, D.C: Island Press; Smart Growth America, 2003, Measuring Sprawl and Its Impact. 3. It is often expressed in terms of gross floor area of a building - the "floor space index" (fsi) or in dwelling units per hectare or acre (uph/upa). 4. Blais, Pamela. Inching Toward Sustainability: The Evolving Urban Structure of the GTA. Neptis Foundation, March 2000. 6. Urban Travel and Sustainable Development: The Canadian Experience, prepared for Canada Mortgage and Housing Corporation by IBI Group, 1993. 9. Op cit, OGTA Urban Density Study. 10. In Figure 1, net density is measured in units per net hectare. 11. Metropole Consultants. The Growth Opportunity: Leveraging new growth to maximise benefits in the Central Ontario Zone, report to the Neptis Foundation, April, 2003. 12. 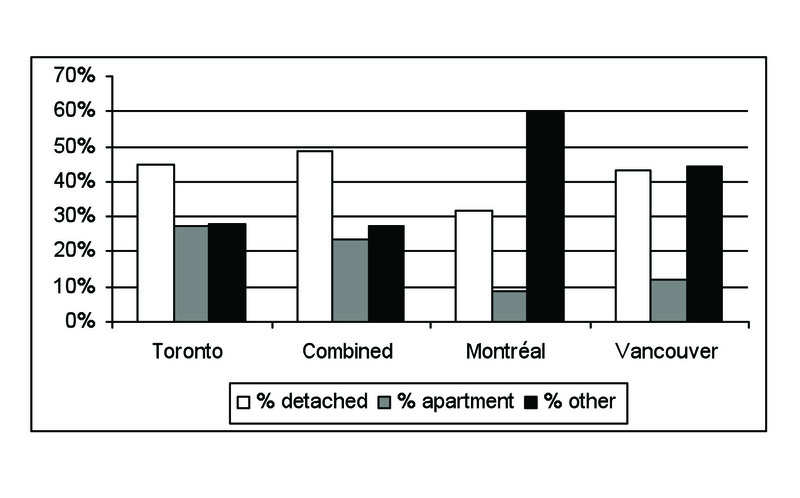 Source: Statistics Canada, 2001 Census, Private households by structural type of dwelling, census metropolitan areas. "Combined" refers to an aggregation of data for the Toronto, Hamilton, St. Catharines-Niagara and Kitchener. The "Other" types is defined by Statistics Canada as "Includes semi-detached houses, row houses, apartments or flats in a detached duplex, apartments in a building with fewer than five storeys, and other single attached houses." 13. Source: Canada Mortgage and Housing Corporation and the Ontario Ministry of Municipal Affairs and Housing, The 2001 GTA Residential Land Inventory Survey. This data is only available for the GTA. Units include those in draft approved development plans and additional supply (i.e. lands under application but not yet draft approved). 14. See, for example, Inching Toward Sustainability, op cit, or Canadian Urban Institute, 1997, GTA Urban Structure: An Analysis of Progress Toward the Vision.